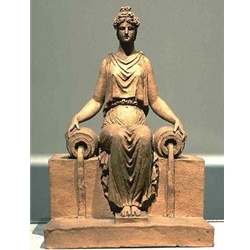 Antique-style figure, holding in each of her hands an urn from which flows a trickle of water. The lengthening of the neck and of the head, the very fine canon of the hands and the feet, the antique-style hairstyle, are characteristic of the production of Dumont during the years 1795. Practically symmetric, it was doubtless the model for a monumental work, but could also be a project for a piece of goldsmith's craft.